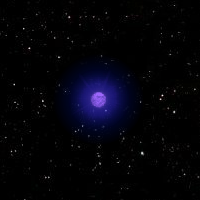 Absolute Magnitude is the actual brightness of a star. If you take two stars and look at them from the exact same distance, the brighter one will have a higher absolute magnitude. Stars that are larger or hotter will have a higher absolute magnitude. Accretion is the process by which objects pull in matter from the interstellar medium or from nearby stars. 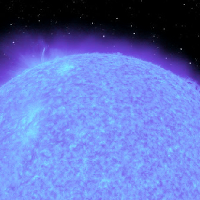 Protostars accrete matter as they are forming before they achieve hydrogen fusion. White dwarfs and and neutron stars can also accrete matter on their surface by pulling it away from a companion star. When this matter builds up, it will ignite a fusion reaction called a Nova. The blast from the nova will blow the accreted matter back into space and the process can begin again. Black holes will also accrete matter. When gravity pulls matter toward an object, it tends to spiral in. This spiraling matter forms into a disc, rotating around the central object. When the accretion disc forms around a young star, the matter will sometimes form into planets, like in our solar system. The gravitational forces acting on an accretion disc causes a lot of friction as particles bump into one another. This heats up the disc and causes it to glow. Apparent Magnitude is the brightness of a star as observed from earth. This means that stars that are far away often appear dim compared to nearer stars, even though they may be brighter. A black hole is a remnant of a supermassive star's core. A black hole is so small and dense that even light can't escape from it. The intense gravitational field of the black hole simply bends the light back inside before it goes anywhere. Brown Dwarfs are protostars that never got hot enough to ignite hydrogen fusion. 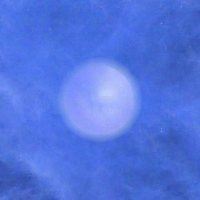 They glow very dimly, making them very hard to detect. Deuterium is a special kind of hydrogen atom that has both a proton and a neutron. Although deuterium is breifly created during one of the steps of normal hydrogen fusion, finding deuterium floating about is very rare. When a star achieves Equillibrium, its internal forces pushing out are equal to the force of gravity pushing in. This only lasts as long as the star has fuel to burn in its core to maintain its internal forces. When the star runs out of fuel, the outward forces begin to weaken and gravity begins to make the star collapse. The Hertzsprung–Russell (HR) Diagram is a chart that scientists use to study stars. It plots them according to their brightness (Absolute Magnitude) and their temperature, which determines the color of light they produce. By plotting stars on this diagram, astronomers were able to see patterns, which in turn helped them understand more about how stars changed throughout their life cycle. The Interstellar Medium is made up of small particles of dust and gas that exists in the space between stars. Although it is mostly made up hydrogen, events like supernovae will blast heavy elements like iron out into space where they become part of the intersteller medium. These elements will then be pulled in by new protostars to form new stars and planets. The Main Sequence is the name for the longest stage of a star's life cycle when it is burning hydrogen at its core. 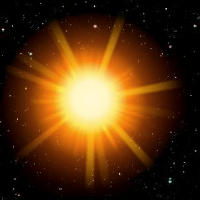 Our sun is an example of a main sequence star. More massive stars will spend less time in the main sequence, while stars smaller than our sun could spend trillions of years as main sequence stars. 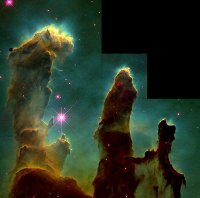 A Nebula is an area where the interstellar medium has clumped together to form a huge cloud of dust and gas. Nebula are often created when a large star goes supernova and throws most of its matter into space. Nebula are also the birthpalce of most protostars. 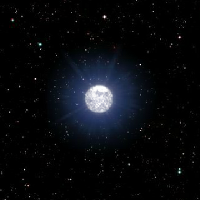 A Neutron Star is the core of a star that has gone supernova. The pull of gravity has crushed the matter together so tightly that individual atoms are forced together, losing their electrons. The resulting matter is made up of tightly compressed nucleons, mostly neutrons. Even though it might have more mass than the sun, it is compressed to a tiny ball only about 24 kilometers apart. When the outer shell of a Red Giant star drifts off into space, it forms a Planetary Nebula. Positrons are incredibly small subatomic particles with a positive charge. They are antiparticles, or small pieces of antimatter. Positrons are the antimater equivalent of an electron, so they are sometimes called antielectrons. Positrons are created during the hydrogen fusion process when a proton changes into a neutron. Because the positive charge of the proton can't just disappear, the proton emits a positron, which carries away the positive charge. These positrons don't last very long, because as soon as they encounter an electron, the matter and antimatter anihilate one another, releasing energy in the form of gamma rays. A Protostar is a ball of dust and gases that has not yet reached a high enough temperature to begin hydrogen fusion and become a star. It will continue to accrete more matter and heat up until it reaches about 10 million degrees kelvin. Deuterium burning will slow down that process, allowing the protostar to become bigger before it ignites. 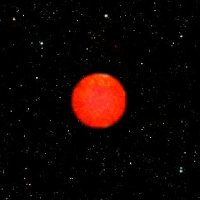 A Red Dwarf star is a small star with less mass than our sun. Because it has less mass, the fusion reactions that take place within the star do so more slowly, giving the star an incredibly long life span. Currently, the universe isn't old enough for even the oldest Red Dwarfs to have burnt out. 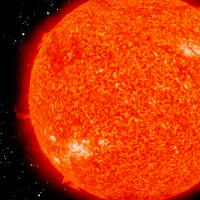 Stars that have begun to fuse helium in their cores expand to become Red Giants. As the surface of the stars expand, they begin to cool, giving the star an orange or red color. 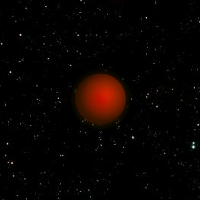 Red Giants are not as stable as main sequence stars, and most will eventually blow their surface off into space, forming a Planetary Nebula. The most massive stars will leave the main sequence relatively quickly, becoming Supergiants. A supergiant star has enough mass that it will be able to fuse not only helium, but heavier elements, as well. When iron begins to build up in the star's core, it will become unable to maintain equillibrium and will collapse, resulting in a supernova. Since most of the matter in a supergiant is blasted into space during a supernova, black holes are limited in how massive they can become. However, when multiple black holes come together to form a single object, they can become Supermassive Black Holes. Many scientists believe that supermassive black holes can be found at the center of most galaxies and other large objects. A Supernova is the explosion that occurs when a supergiant star's core collapses. The tremendous amounts of energy released in this explosion allow elements heavier than Iron to be formed. When the explosion dies down, the remains of the star are usually form a nebula and a neutron star, although very massive stars may leave behind a black hole. White Dwarfs are the cores of Red Giants that have lost their outer layers. White Dwarfs are no longer capable of fusion, but they are incredibly hot, which means that they will shine brightly for a very long time.